What do you do when you're tired, feeling restless or stressed? Before, I go on shopping. But since that makes me end up being broke or buy stuff which I don't really need, I try not to do that anymore. I still go on retail therapy at times, but lately, I just indulge myself with good food. And when I say good food, I mean comfort food! When I was still in Manila, I usually go to Friday's or Chili's. 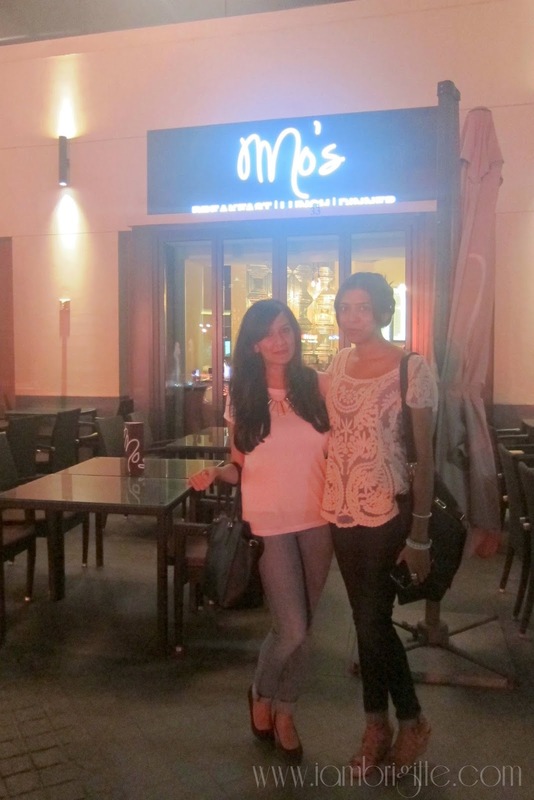 So when I was given a chance to try Mo's Dubai (thanks, Caramel Group! ), known for its wide selection of what we call comfort food, I just had to say Yes. Besides, it's also a chance to connect with some other bloggers in the region. I rarely go out on a weekend, but I just felt that I need to amp up on my so-called social life which is by the way already dying. Hahaha! I was told that Mo's is a casual dining restaurant but I can tell it has a fancier vibe to it as soon as I entered the place. 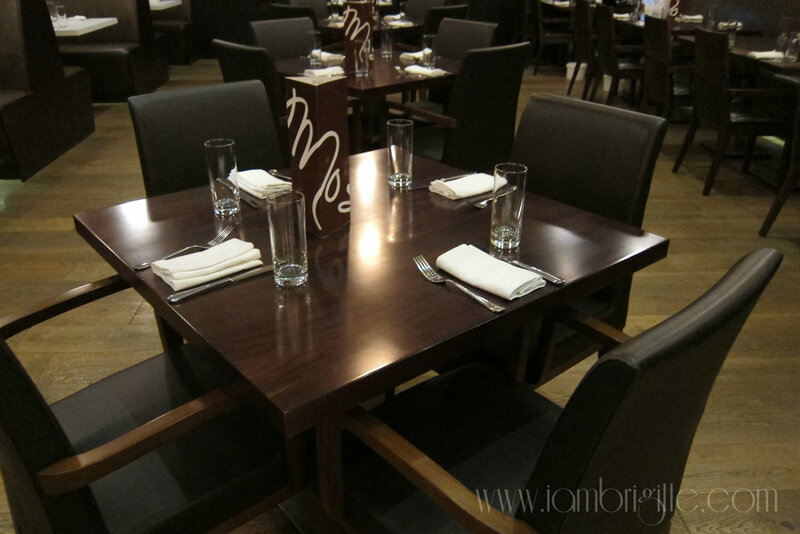 But I never felt intimidated as I would normally feel whenever I go inside an upscale restaurant. Instead, I feel the hospitality and warmth of the staff. As soon as I entered the restaurant, I was greeted by the staff and even walked me to our table. The manager even approached our table, introduced himself and had a short chit-chat with us. If it's my first time in a restaurant, I usually ask my friends to order for me. Or sometimes, I ask the server what's good in their menu but I usually get the answer, "everything is good." (laughs) At Mo's, they know their menu by heart. 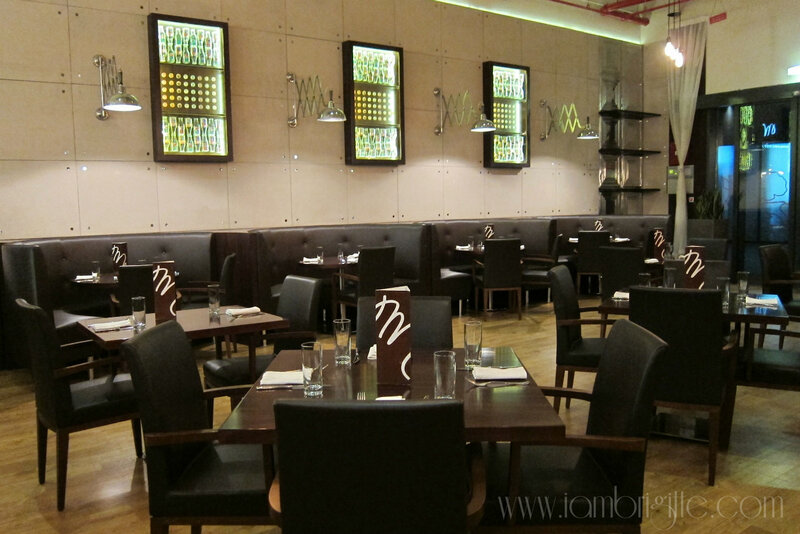 They would ask you what you prefer: pasta, seafood or salad and they will recommend what's best in that selection. And what can I say? Their recommendations are spot on! There was nothing on our table that night that we didn't like. 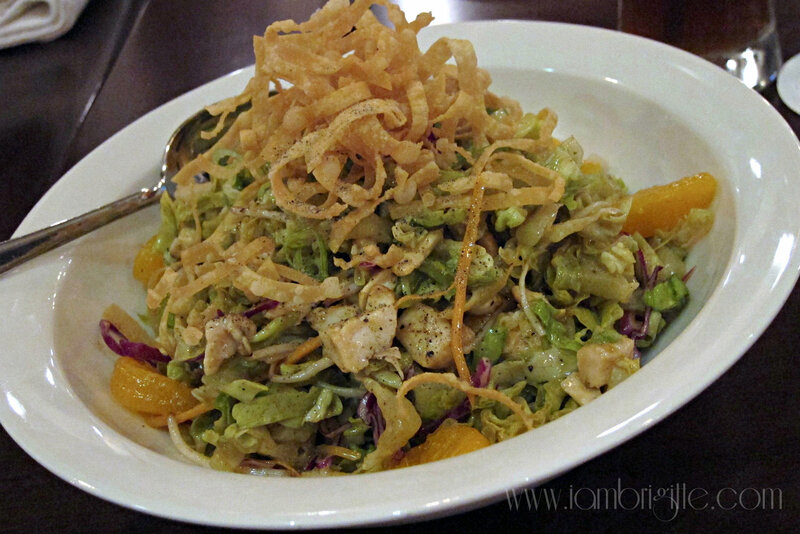 I'm not that adventurous when it comes to salads as I always opt for the Ceasar Salad. But let me just say that this by far is the best Ceasar Salad I've tried. The dressing, which is mainly made of lemon garlic plus other secret ingredients, gave the salad the zest that most caesar salads lack. The girls prefer this salad more, but I can't blame them. This is one bowl of goodness, with tons of flavours and textures, mixed with an asian peanut dressing that put everything together. It's delicious, and it's probably a salad that my dear Mom would like but what can I do, I'm a simple girl so I like simple things. 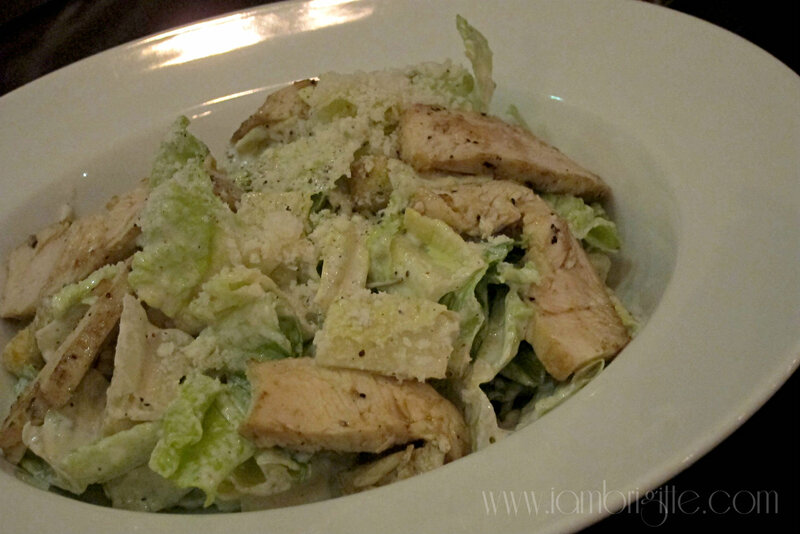 So yes, I am sticking with my Ceasar Salad! Hahaha! I'm a sucker for chips and dips so this appetizer got me all excited when it was served. The perfect crispiness of the fresh tortillas plus the creaminess of the cheese dip literally made me want to finish this dish all by myself. Next time I visit Mo's, I'll make sure to order this and not share it with anybody. Yep, not even with the husband. LoL! 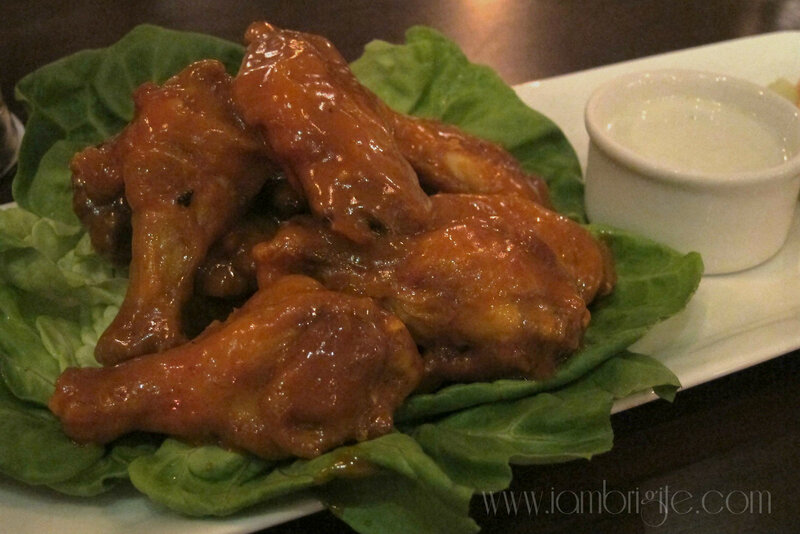 This one is simply finger-licking good! When I'm dining out, I try not to eat with my hands as I might get carried away and start to eat like when I'm at home. (You know, eat with both hands and one leg up on the seat kind of thing, hahaha!) But this dish made me forget the little poise that I have left. I can say this is already ulam-material at kulang na lang talaga is kanin! The chicken is succulently moist (unlike some where the chicken can be so dry and tastes like it has been fried a number of times already) and the sauce has just the right spiciness. 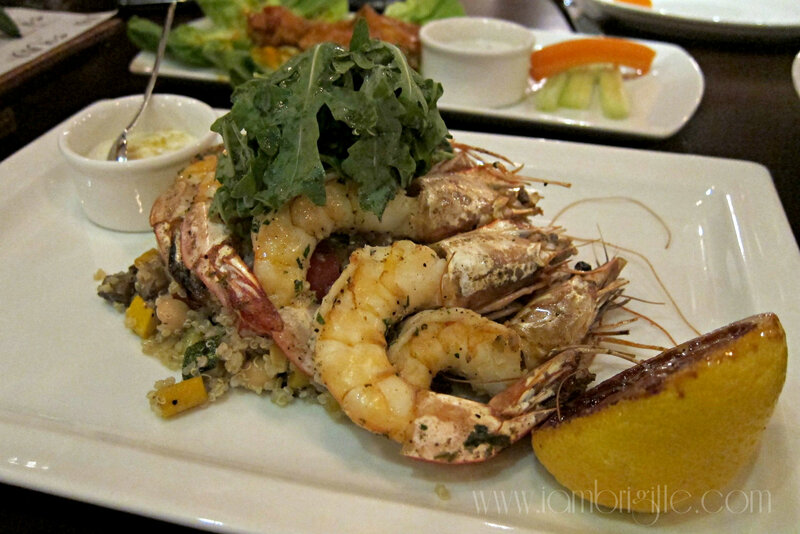 For the mains, we had Grilled Shrimp and Simply Grilled Salmon. It was my first time to try quinoa and well, I was not disappointed. It is considered to be one of the healthy foods and so I felt like I am eating healthy despite the tons of calories I am taking in and still about to take in that night. I bet my Mom would give me a pat on my back if she learns that I've finally tried quinoa. I can see myself eating more of this in the future. Yes, this dish might look simple but its taste is not anywhere near being simple. 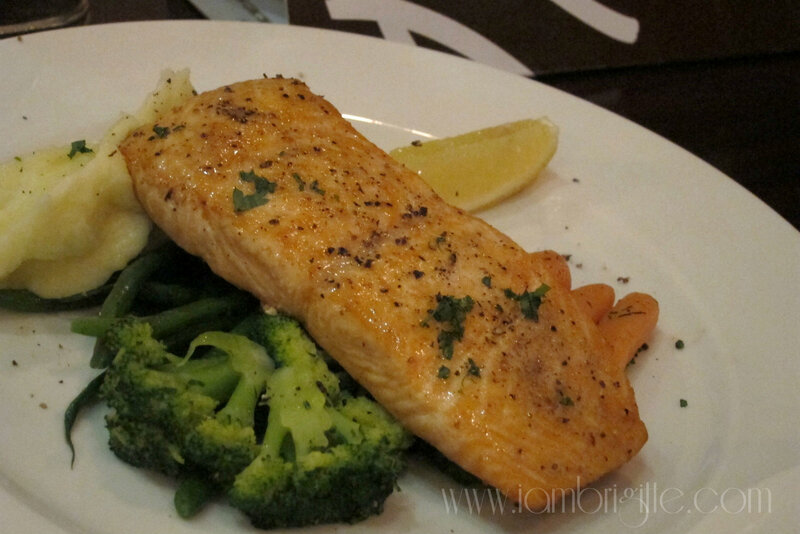 There's a burst of flavor in every bite of the salmon and the mashed potato, it's the best that I've tried! I prefer my potatoes baked as mashed usually makes me go "bleh!" but definitely not this one. We are almost full but Stacey and Tanya insisted that we try one of Mo's best sellers, the TNT Shrimp Tacos. And boy, Lady and I were so glad we gave in. It didn't look so special when it was served but the moment I had a bite, all I can do is give a thumb of approval that this dish is indeed the bomb! 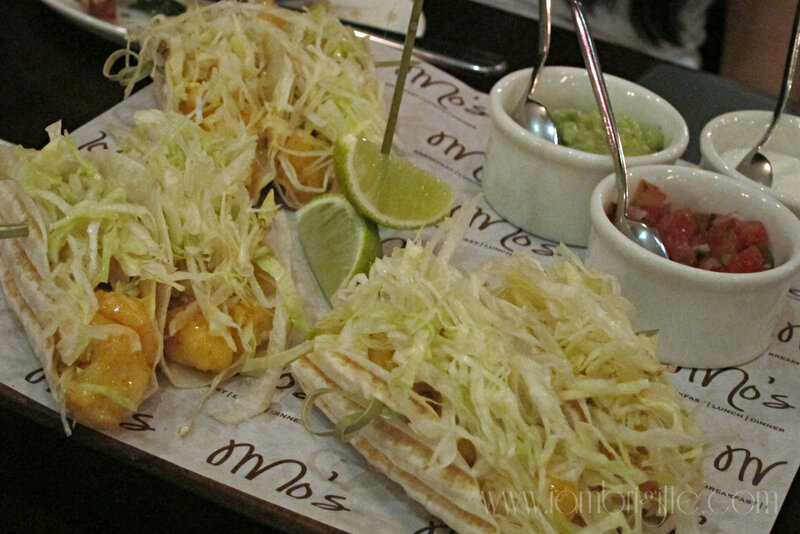 The slightly toasted soft taco complemented very well with the freshly, battered shrimp and slaw. It was already so good I didn't bother putting anything on it as the dish also comes with 3 dips: guacamole, salsa and yoghurt. If this dish is a guy, I'd literally ask him to marry me right then and there! Mental note to self: order this next time and again, not share with anybody! Just when I thought we won't be having any desserts because there's almost no room for it left, Tanya and Stacey again insisted that we try Mo's desserts. And again, who am I to say No to good food? I love ice cream and if i get to choose one dessert, I'll always go for ice cream. And well, being the matakaw that I am, I won't settle for one…but for three! Their ice cream does not taste like any other ice cream that I've tried in the past but it's really good. It doesn't taste like commercial ice cream and the sweetness is just right. I didn't feel like I'm gonna go sugar-crazy even if I finish the entire dessert! Too bad I'm not a fan of bananas. Yes, I rarely eat bananas. I was only after the 3 scoops of ice-cream. Hahah! 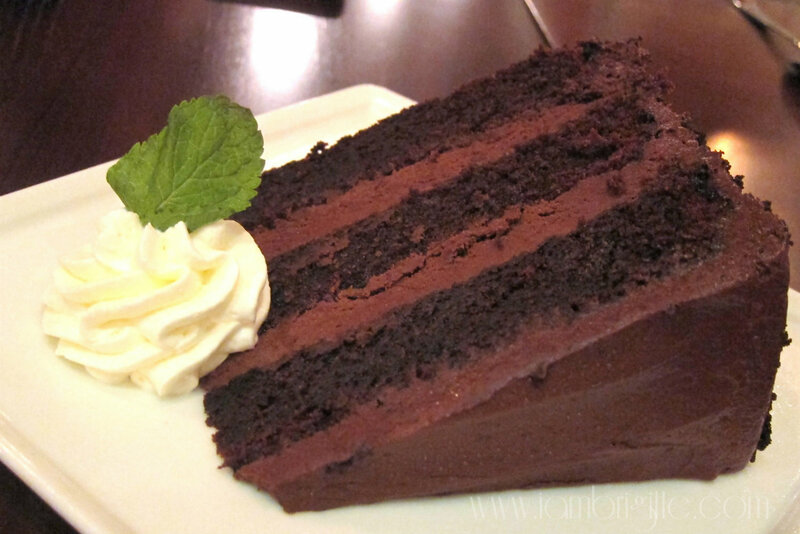 If you want that death-by-chocolate kind of thing, order for this cake! It's so rich and has a lot of chocolatey-goodness. I only had a bite of this one because I was busy trying to finish my ice cream! Lady made sure she gets to order this. 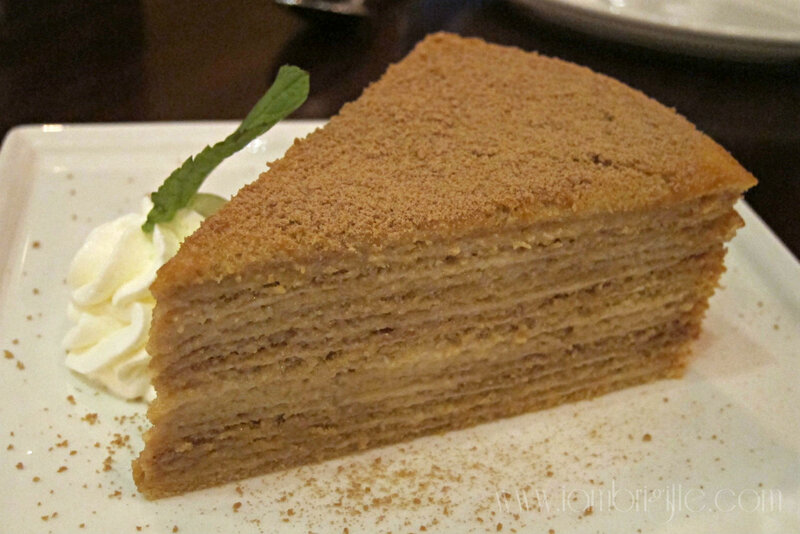 We were just talking about how good the Spinneys' honey cake is but right after we had a bite of this baby, we were like, "what spinneys!?" It's so unbelievably delicious, it's soft and it literally melts in your mouth. Geesh, my mouth is watering as I'm typing this! I can really say that I gained a couple of pounds that night with all the eating we did but what the heck, who would care about it if you're dining with such a great company? I've known Lady for months and have only saw her four times, while it was our first time to meet Stacey and Tanya but it was like we've been friends for a long time. We've been giggling like high school girls in between our bites and chit-chats. The setup is simple, minimalist yet classy. They have ample space for people, most especially kids, to move around freely too! 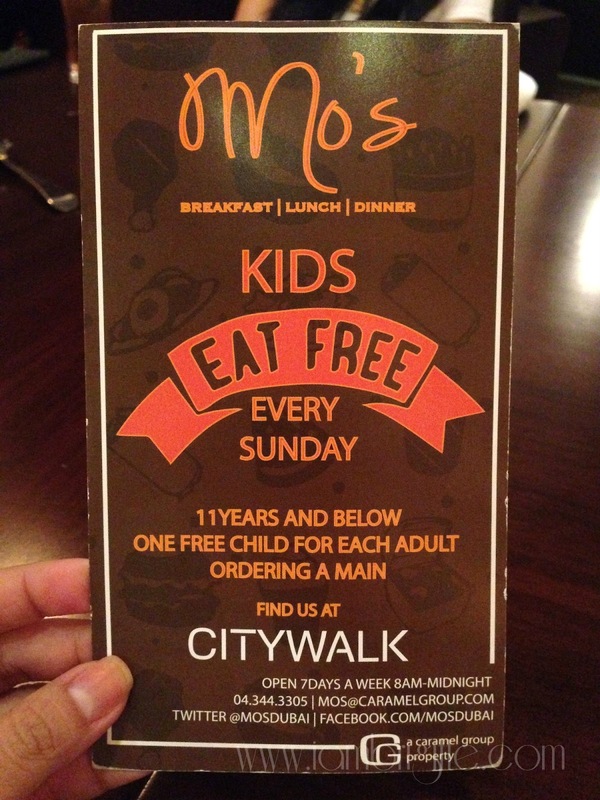 Aside from the amazing food and the place (it's located in Dubai Citywalk), their customer service is highly commendable as well. Their staff is so attentive they are always at our beck and call. They also provided me with a purse hook so I won't need to have my bag sitting on my lap. Whenever we look around, the staff will come to us and ask if there's anything else we need. Even the manager constantly checked on us to ask how are we liking our food, etc. 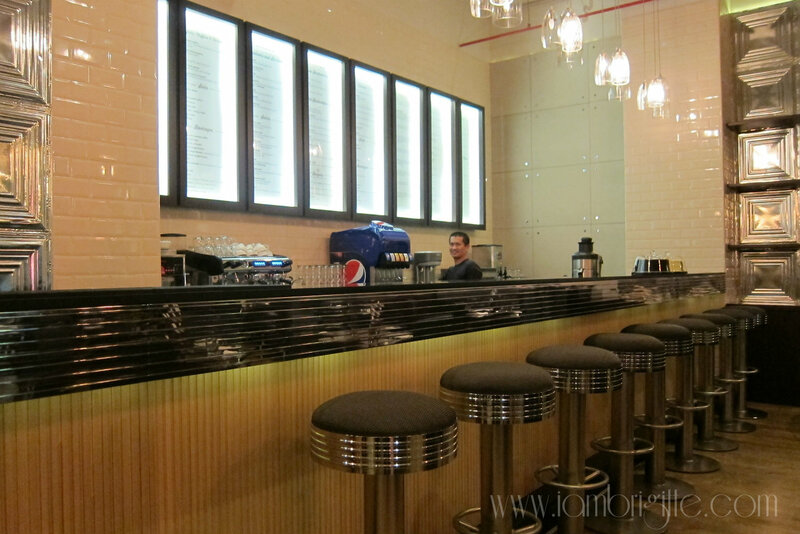 By the way, Mo's Dubai is located at Citywalk in Al Safa Street. I wanted to kick myself for not bringing my DSLR with me that night as I could've taken more shots of the amazing location. 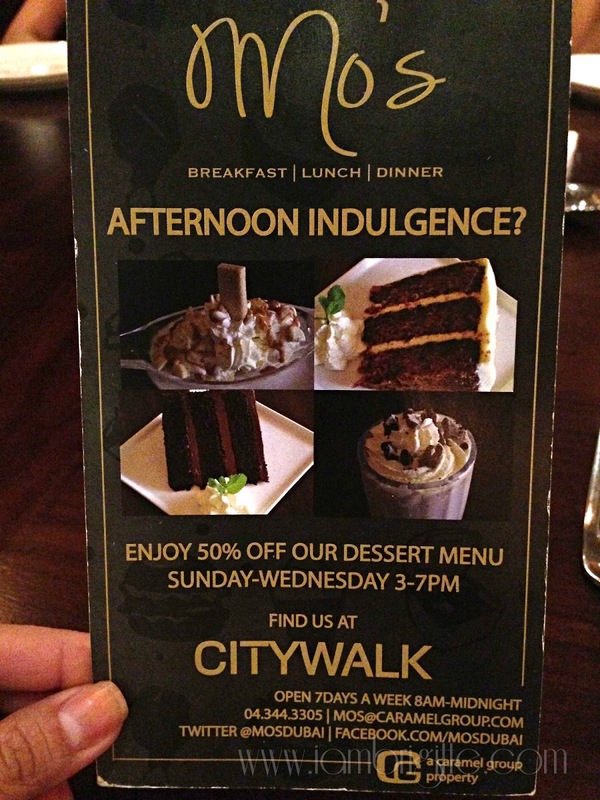 City Walk has an outdoor lifestyle concept where you can do almost everything: dine, shop, relax and workout (yes, they have a gym there too!). At its center, there's a fountain which is such an eye candy most especially if you're dining outside. But that has to wait until summer ends. I bet this place is hustling and bustling during the colder season. Also, for a limited period, you can get 25% off your bill by following them on their social media accounts and mentioning that to your server. 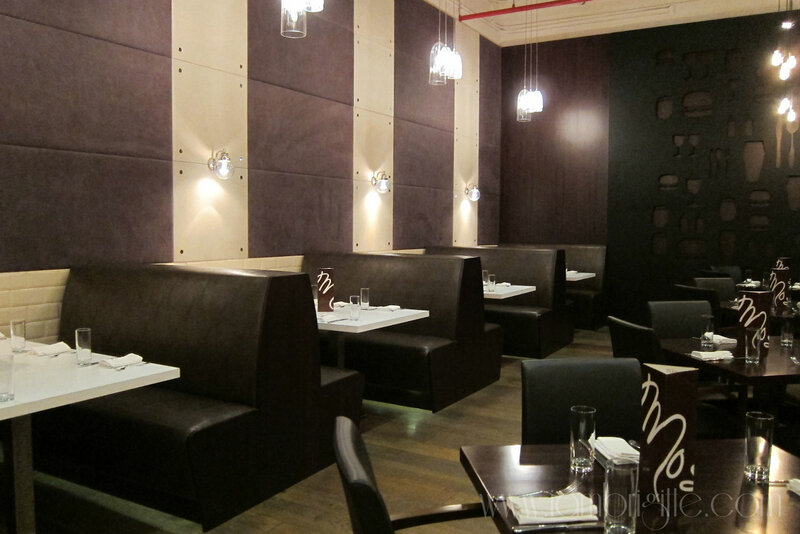 If you like to enjoy Mo's dishes right at the comfort of your home, they have the Call and Collect option. Give them a call, place your order and drop by to pick 'em up. 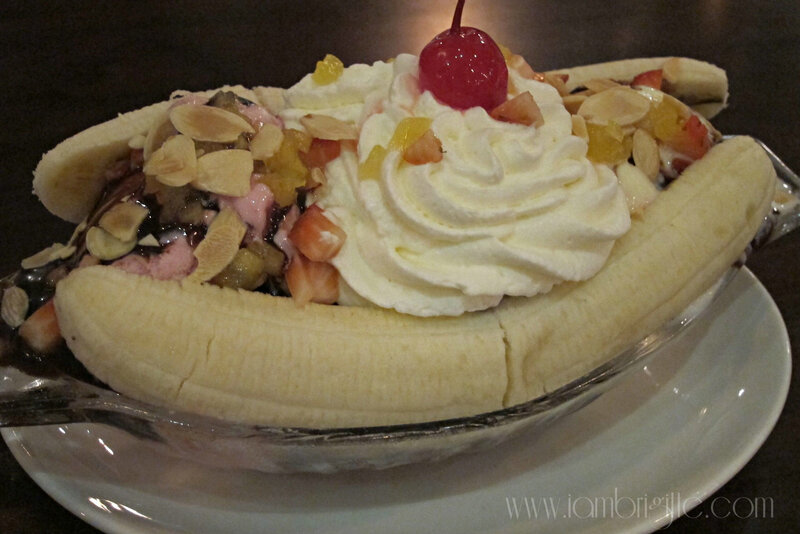 We were also informed about Mo's Sundae Challenge: finish their Party Sundae (which has 8 scoops of ice cream, 4 bananas, brownies, caramel sauce, hot fudge, toasted almonds, chocolate sprinkles and 8 maraschino cherries and whipped cream topping) and it'll be for free. On top of that, you'd get a shirt and your name will be put on their Wall of Fame. Honestly, I'm up for it if not only for the bananas. Hahaha. 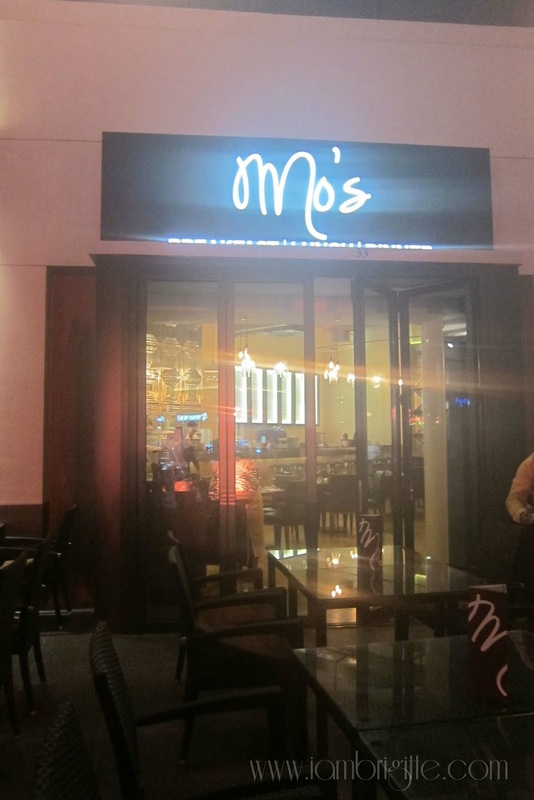 A meal at Mo's will cost you between 200-300Dhs for two. It's expensive, yes, but definitely worth its price. It's one of those restaurants where you can go and come out happy without thinking that your money went down the drain. 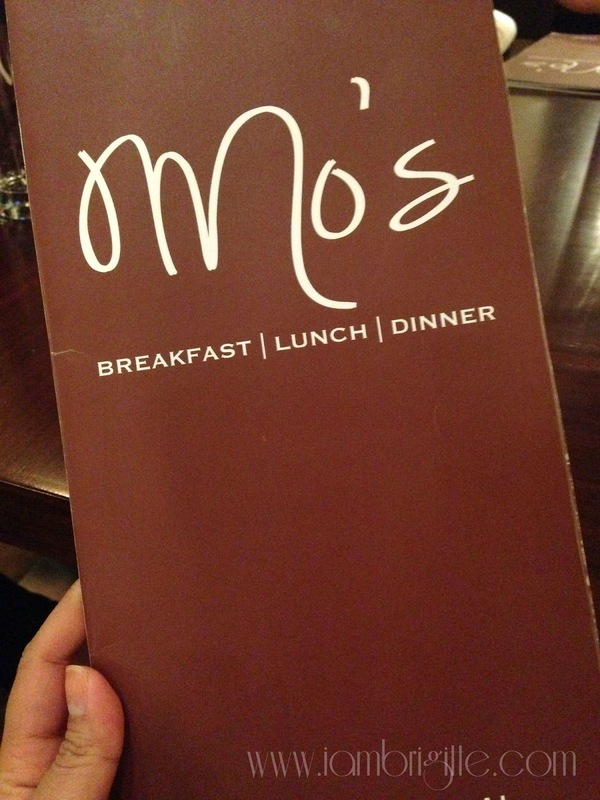 I will definitely go back to Mo's soon and try what they offer for breakfast. The milkshakes? I gotta try that next time! 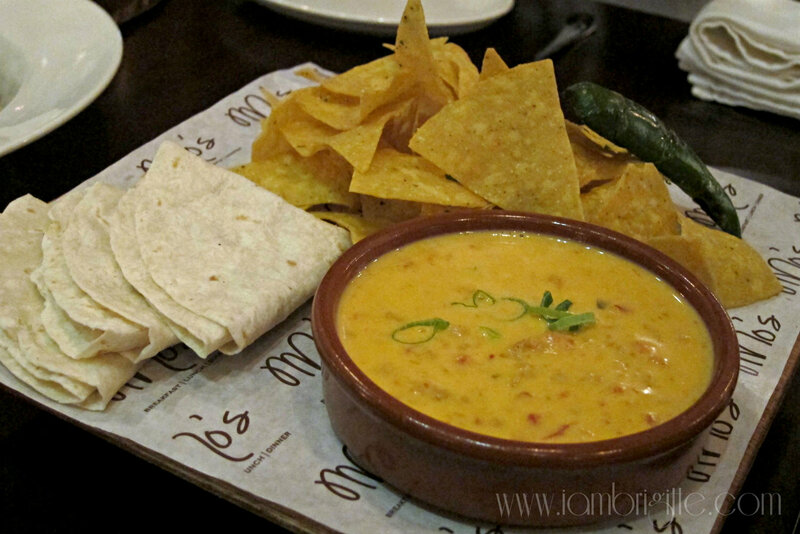 And of course, I'll have quezo fundido and TNT shrimps for starters, all for myself. No sharing. Thanks also to Stacey, Tanya and Lady for that wonderful night. Meet up again soon for more banana and biscuit chit-chat!? 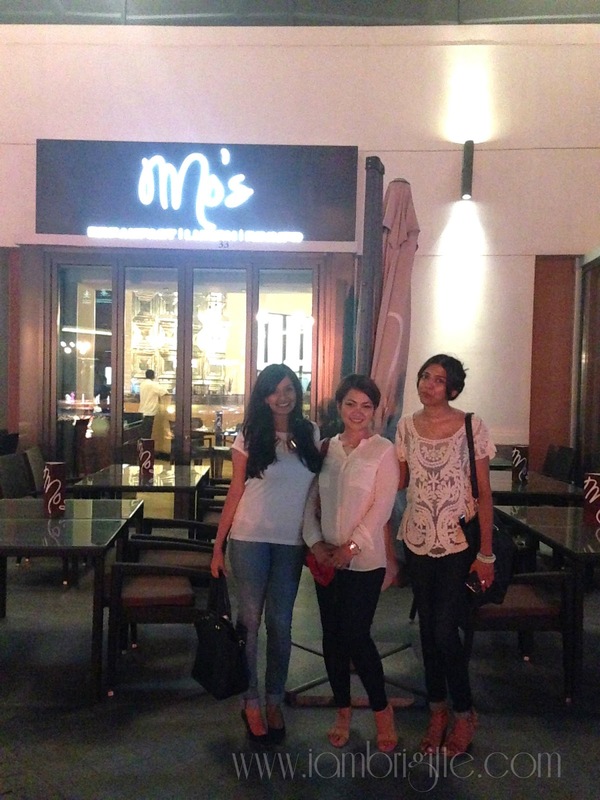 Mo's is one of my favorite restaurants in Dubai. I did a review for them a few months ago as well. Glad you like the experience. 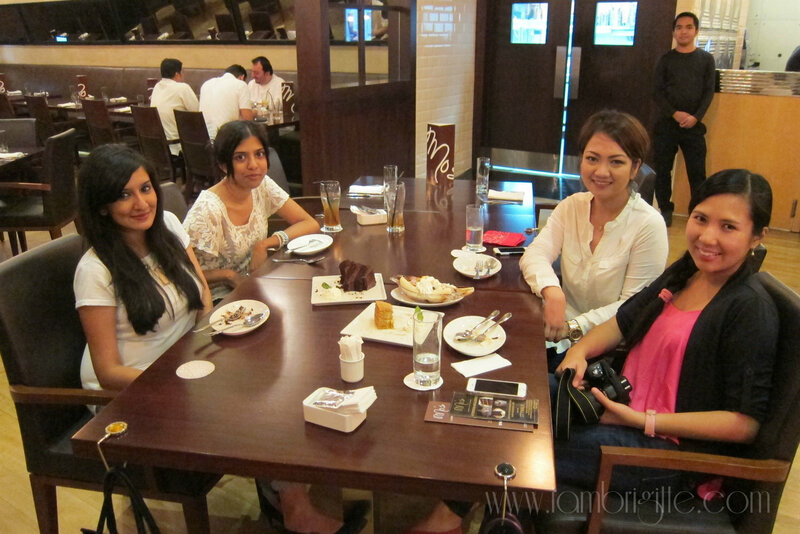 Yes..I had an experience also at atelierM lounge in Dubai Marina for some days. Especially the foods were awesome and delicious to me and my husband. By the way, Can't share the experience of "Wine" in there. I hope you guys realize. Thanks! 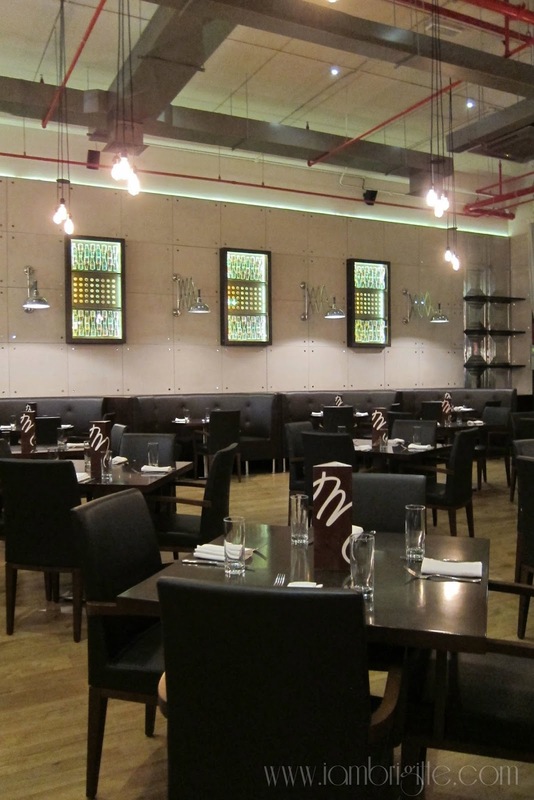 I love at Wagamama in Crown Plaza which is situated in Dubai. Last month we stayed Dubai for about 15 days and we took our dinner there. You know their teppanyaki, salads were really awesome and also delicious as well which we ever ate. Hope in near future we will go again there.